Earlier we introduced two types of bolts: the serrated head bottom and the square headed bolt (M3, 6mm length). What screw – serrated, square headed, with or without hexagon socket – should be the default MakerBeam screw? The regular bolts worked for the old, non-anodised, beams that had surprisingly high friction. 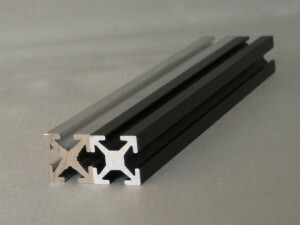 The new, anodised, beams have a harder and more smoother surface. A surface that provides less friction and occassionally left a round head spinning. We wanted to eradicate this problem. Especially since there always was the suspicion about makerbeam that tightening would be a issue. Clearly we needed to find bolts that provided better grip. The square headed bolts were the best option we thought. Unfortunately enough the production time was unclear. The serrated head bottom then was introduced as a temporary alternative. When the square headed screws came in – surprisingly fast – we decided to make these the default MakerBeam screws. Not everyone was pleased by that decision and we started to have our doubts. We needed more input and a test was put in place. Tinhead, MakerBeam fame: – The Stinger – a PCB milling machine (and Let’s Make Robots contributor). Fit: The square head bolt fits the makerbeam profile better than a round headed bolt. Tightening: As you tighten the square headed bolts the bolt spins slightly inside the beam till the corner of the bolt hits the interior of the beam thus making two triangular contact areas. The square headed bolts tighten down stronger since they do not turn in the beam. As Tinhead expressed: “they work better as they do not turn once on the beam as with the normal round ones”. Round heads, serrated or not, definitely have a disadvantage here. 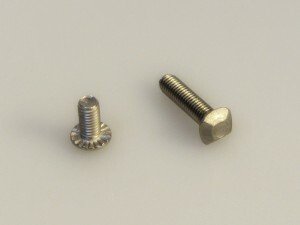 Therefore Anders sees no real purpose for the serrated head bottom screw in comparison to the square headed bolts. Joel is a big fan of the serrated screw. “You can get the same amount of tightness witht the serrated bolts as witht the square headed ones.” His issue with the square headed bolts comes when overtightening them. Overtightening: Joel had overtightened the square headed screws and had problems removing them. Removing the square headed bolts could not be done without a tool. This damaged the thread of the screw rendering the screw useless. Sean even thinks tightening the square headed bolts hard deforms the beams less than it did with the round heads. Since the contact area is larger. For Joel it is another factor in favouring the round headed serrated screws. They slide in easier. Sean completely accepted the new ‘workflow’. He was sceptic because of the ‘sliding’-issue. But now only uses the square headed bolts. The other screws need fiddling to get in. “They were so large that they barely fit in past the ends of the beam.” According to him these two amounts of effort – fiddling vs. aligning – are roughtly equal amounts of work. Sean has become a fan of the square headed bolt. Backwards compatibility: We like looking forward and this is why we had these bolts tested. But there is the issue of backwards compatibility. The square headed bolts work well with old makerbeams (v1.0) and the new beams. (v2.0). Here is a link to link to our blog post ‘Version 2.0’. The serrated did not fit very well with the old beams. The suspicion about MakerBeam that tightening would be a problem looms large. We realised this again upon discussing the results. Eradication of this suspicion is our main concern we realised. We feel the square headed bolts tackle this issue best. They provide a better grip and fit than other bolts. The square headed bolt will become the default MakerBeam bolt. Plus, we are looking into adding a hexagon socket on the head. The serrated head bottom screws will gradually disappear from our stock. It is a fact the NEMA 17 brackets are in demand. 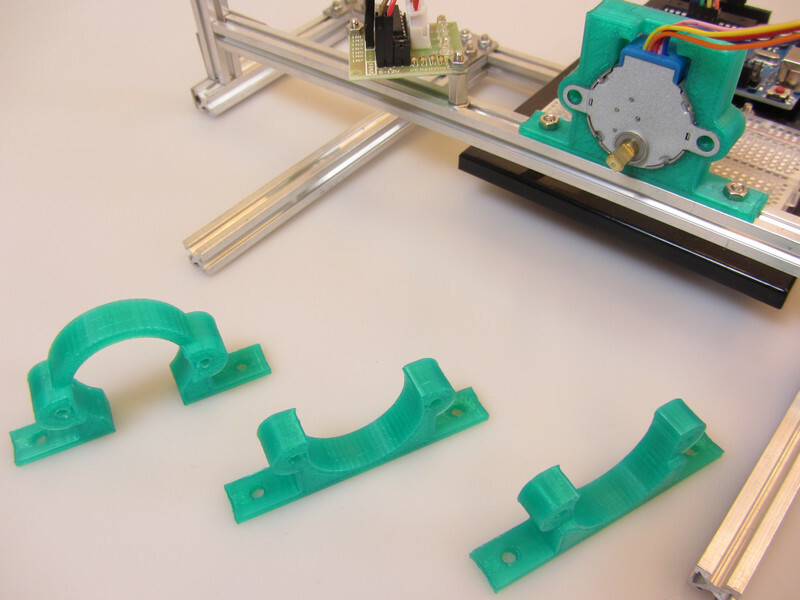 What about servo motor brackets and brackets for micro stepper motors? We wanted to give it a try. Pieter Bos (@pieterbos) gave us a way out. He is the guy that makes our 3D printed end caps. 3D printing is a fun and easy way to try new ideas and 3D printers are very popular with makers. Why not have more 3D printed parts for sale in our shop? We asked Pieter and he started prototyping. You can see the steps he made in the picture below. The first idea was to completely encapsulate the micro stepper motor. From there it went to the lean figure on the right. This design, printed in black, will go on sale soon. They are printed in PLA – polylactic acid. With the servo brackets we dismissed 3d printing but thought of laser cutting. This posed no problem for Pieter. He made some brackets and tried different materials. 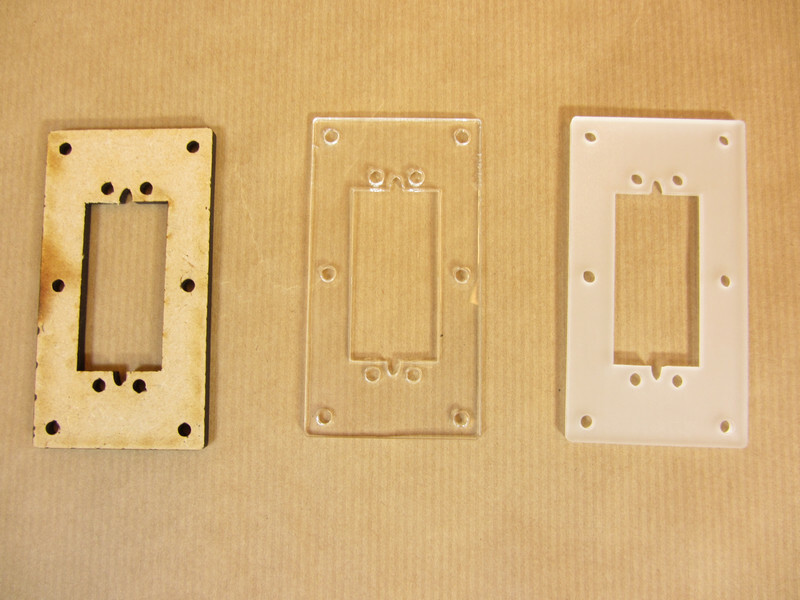 From left to right: MDF, transparant perspex and finally opaque perspex (or polymethylmetacrylaat). We liked the last one the best. This one will go on sale soon. We ordered stainless steel NEMA 17 brackets. The samples came in and we were really pleased with their look, the polish and the MakerBeam artwork around the bracket. There was a surprise as well. 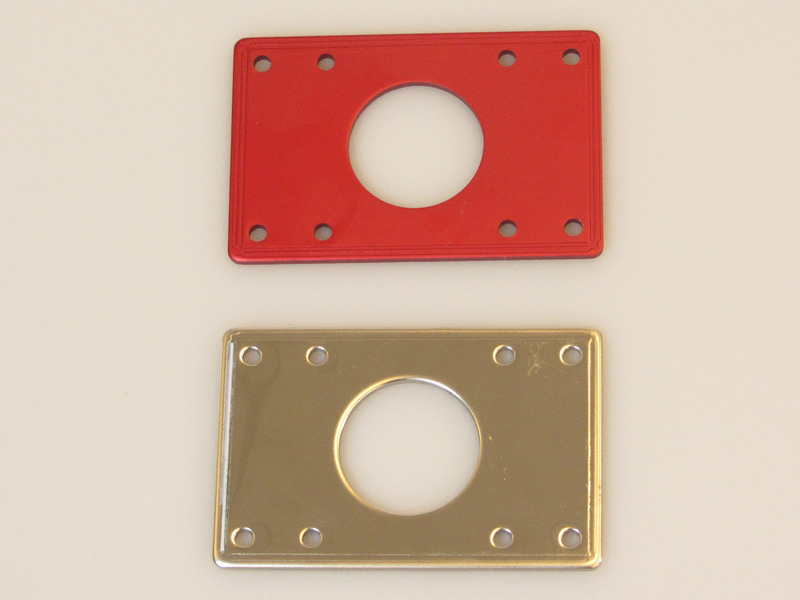 Our manufacturer had added some aluminum anodised brackets in various colours. We thought the red bracket looked great. They go very well with our clear and black anodised beams. Below you will find a picture of the two. A delivery time will be announced on our homepage soon.